Heels up, heads down! 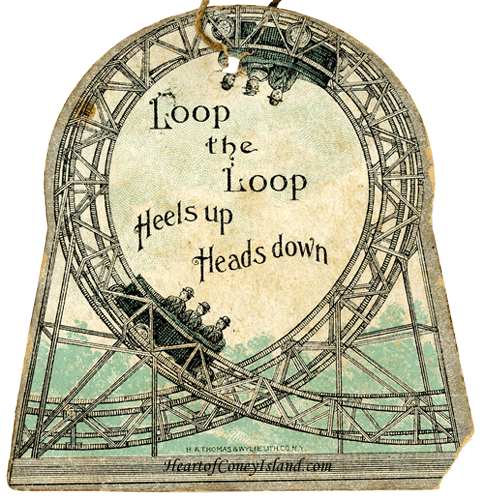 Are you daring - or, perhaps, crazy - enough to ride the Loop the Loop? The first looping roller coaster was Lina Beecher's infamous Flip Flap Railway, installed at Sea Lion Park. Riding the Flip Flap Railway was a bit of a death wish because it used a perfectly circular loop. Even though a circular loop seemed logical, it subjected riders to g-forces that were akin to something like getting in a car and purposely driving it into a wall. Needless to say, the Flip Flap Railway quickly became the pariah of the roller coaster scene at Coney Island. In 1901, the owner of the former Streets of Cairo show came across an improved design for a looping roller coaster and decided to convert his property at the corner of Surf Avenue and West 10th Street to give it a go. The Loop the Loop was the second looping coaster ever built, but has the distinction of being the first modern looping roller coaster. The Loop the Loop used an innovative elliptical loop, which alleviated g-forces. It is the predecessor to all modern looping coasters, all of which use elliptical designs. People were still freaked out by the Loop the Loop because it was still pretty primitive. These were the days before the under-track safety mechanisms had been invented to prevent the passenger cars from flying off the tracks. The passenger cars on the Loop the Loop had actual tires and the only thing holding the cars on the track was a small side railing. At least the riders received a very nice souvenir ticket by which to to remember the ride. The Loop the Loop made more money charging spectators to watch frightened riders than from selling the rides themselves, as shown in the picture. The loop was small because it relied purely on momentum to keep the cars on the track, so the cars had to be small, too. Only four people could ride at a time. Inspectors would only let one car on the tracks at a time fearing a collision if something went wrong. The owner tried adding a second track alongside the first to double capacity, but the Loop the Loop remained only precariously solvent. While it may not have made for the best business model, this coaster certainly captured the mystique of the early rides. Around 1910, the Loop the Loop was replaced by a steel roller coaster called the Giant Racer. 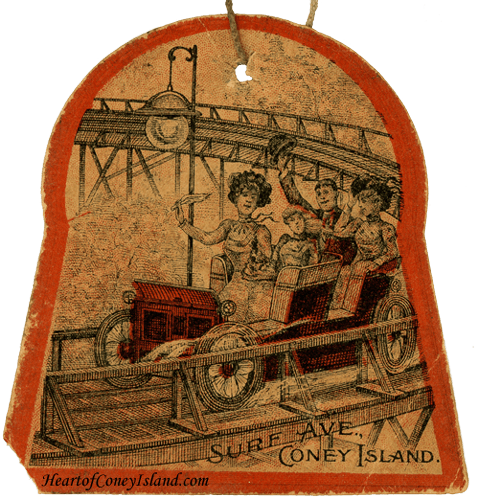 This new coaster was three hundred yards in length along West 10th Street, from Surf Avenue to the beach. It was devised and installed by William Meinch, with the assistance of his friend, Feucht. Meinch’s father, an electrical engineer, had helped LaMarcus A. Thompson build and maintain scenic railways in Coney Island. William had absorbed some of his father's knowledge of things electrical, and was to develop shooting-gallery rifles that fired electrical impulses instead of bullets at targets. Although there were several fatalities during the operation of the Giant Racer, it was considered too tame a ride by the thrill-seekers of the Roaring Twenties, who wanted their coasters to take precipitous plunges, like the one the Stock Market would take shortly. 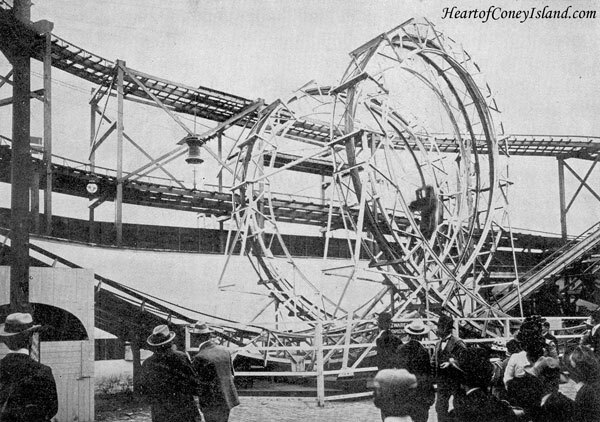 Accordingly, the Giant Coaster was torn down in 1927, and in its place arose the famous Cyclone. The Cyclone was designed with a wooden frame and with less vibration, and was shorter. What made it thrilling were its wild turns and an initial straight-down dive of about ninety feet. This would be equivalent to the tantalizing experience of falling off the roof of a nine story building. As might have been expected, Feucht had a hand in its design and construction. It was first built for the Rosenthal Brothers. Shortly after the Rosenthals became involved in the development of Palisades Park in the mid-1930s, they agreed to sell the Cyclone to Feucht and George Kister, an experienced Coney Island veteran. Kister owned a well-known hotel-restaurant, carousel, theater adjacent to the entrance of Luna Park on Surf Avenue. In 1959, Kister's and Feucht's Seacoast Holding Company sold the Cyclone to the Pinto brothers, Sylvio and Al. After the City acquired the land, the Cyclone was permitted to continue operating under lease to Sylvio Pinto, who ran the ride by himself, until the owners of Astroland took over its management. Today, the Cyclone is operated by the New York City government. * Many thanks to George Davis, grandson of George Kister, for sharing his research regarding his family and Cyclone's ownership history.